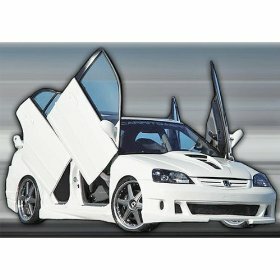 General: Scissor-Slide Vertical Lambo Doors - Scissor-Slide Vertical Lambo Door kit is designed for a universal fit and easy installation. The kit works by opening the door a little to the side and swing it up. It swings up 90 degrees so you dont have to crawl into the car you simply open it get in and close it. When are you are ready to come out then open it again and get out without breaking your back. The vertical door system has four adjustable points on the hinge allows the doors to have a unique look. The kit is 100 CNC machined using 4130 chromyl steel construction. The kits have electrolyses nickel plated for corrosion protection and show quality. It includes four 150lbs struts door hinges adjustable brackets instructions and all hardware required to install the kit. 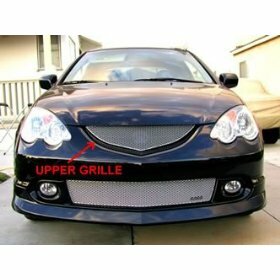 More Details PicturesDodge Neon Installed VideoChevy Cobalt Installed VideoStep-by-Step Installation InstructionsThe kit doesnt come with the a wire extension kit. In most cases the stock wiring should be long enough to have the door open however in some cases an extension wire kit may be needed. Extension kit may to be purchased at your local parts store. 50 weld-on / 50 bolt-on - universal application for all cars trucks and SUVs. 90 degree range of motion. Bolt on hinge with weld on reinforcements. 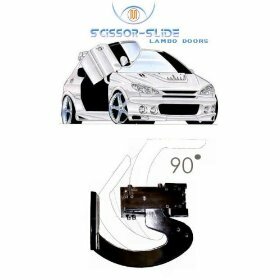 Scissor-Slide Vertical Lambo Door kit is designed for a universal fit and easy installation. The kit works by opening the door a little to the side and swing it up. It swings up 90 degrees so you dont have to crawl into the car you simply open it get in and close it. When are you are ready to come out then open it again and get out without breaking your back. The vertical door system has four adjustable points on the hinge allows the doors to have a unique look. The kit is 100 CNC machined using 4130 chromyl steel construction. The kits have electrolyses nickel plated for corrosion protection and show quality. It includes four 150lbs struts door hinges adjustable brackets instructions and all hardware required to install the kit.Manual Kit 2 Hinges4 150lb Gas StrutsAll Necessary HardwareInstallation InstructionsMore Details PicturesDodge Neon Installed VideoChevy Cobalt Installed VideoStep-by-Step Installation InstructionsThe kit doesnt come with the a wire extension kit. In most cases the stock wiring should be long enough to have the door open however in some cases an extension wire kit may be needed. Extension kit may to be purchased at your local parts store.